Something I don't think I have discussed before is the way in which Screenshots can help with getting the art for a game completed, or moving along a much more complete path. There are a couple of elements to this. 1. You want your screenshots for your game to be as good as you can make them. Most people only see a few screenshots before making a decision on buying the game, be them on the back of a box on a web page in a review. So you really want them to be as good as you can make them.... (they will Never be perfect!). 2. Screenshots highlight a section of your game, or level or scene or whatever it is. This highlight does not always show context. It is unlikely to show as well as if the level is scrolling, moving etc. This highlighting can be a bit of a shock to view. It will tend to be plain. And we don't want plain in our pictures. #1 has already stated how important they can be. There is another great use of screenshots that most people do not bother with, or have the time to use them for. I am talking about Sprucing up the area of the screenshot. Giving the area a nice working over to improve the look, and even perhaps make an average screenshot look good enough for the press kit. I have just done this to a very limited extent to show Leilani how this works and how beneficial it can be. So I took several screenshots, then one lunch time we sat down and discussed what we liked and didn't like about them. Good fun and the food was great too! (Thanks Brick Oven). The Sky is missing something, it is too bland. The trees look all the same color wise. The front log is a bit over bright. The shadows under the trees is a bit small, and is over the roots. 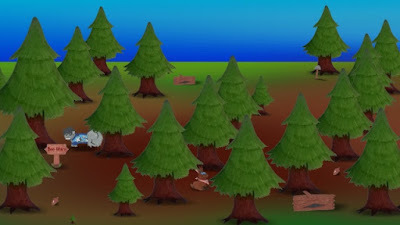 The area does not look dark enough for a forest. I placed some clouds in the sky, it was easy to pull them from another scene and place them. I used to have a routine that gave the trees a variety of color. This was broken by me in the prefab. I actually moved the re-colorizing code to another class. So that was an easy fix. Easy to darken the front log of course. 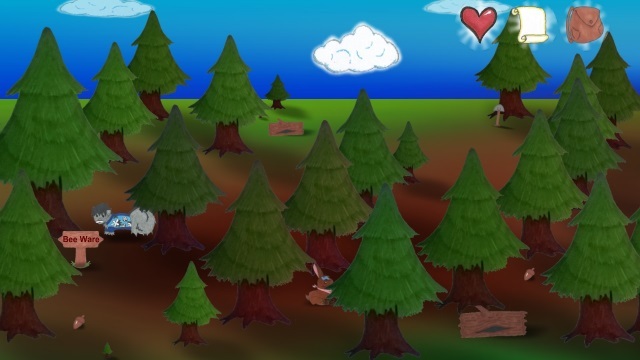 I spent most of my time working on the shadows for the trees. I had to get a good angle and also a good size for the trees. Now I think it worked out great, only I do believe I will darken under the trees a bit more, but the lengthy shadow is good. With the extending the shadows for the trees it addressed the darkness of the forested area quite well. I hope you like the example above. I now believe that this screenshot is much better than the first and also good enough for the press pack! Yes that's right. It means I now need to do a lot more work to support the Show and Tell I am planning for this Demo. This Demo is going to be mostly for showing off the game to potential voice actors. I want them to see what the game entails and make sure there is some enthusiasm for their parts. It will also be a great way for me to get practiced at presenting the game and seeing what works and what does not. This will be a big event for me and Leilani, oh and the game of course. Also we have discussed having some associates here who have a large social following, as it would be silly to miss out on any promotional opportunities while doing something this big for the game. I am currently working on a list of people I want here for the presentation. It will include Actors, friends who I hope to convince to help me test or finish some content in the game (create new quests etc). People to help promote the event (social media associates). So now I realize that if I am going to get the word out that the game exists, then I need a proper landing page and information on it. That must include at least a press Kit, and a way to have people sign up for an email list for more information. I will then be able to use that list to find Beta testers and get people to buy the game when it comes out. I am not sure what else, but I suspect a lot more! However you pronounce it, the Gif is an eye catching element to any web page. It can bring any Web page to life instantly. Generally they are very focused visuals which should make them even more inviting, noticeable and engaging. This image above is my first Gif. Yes really! After more than 30 years in the industry this is the first Gif I have actually created myself. This one above is a test... can I do it, does this kind of thing work... or will it? Ok, so I cannot answer all those questions obviously at this time. I am an avid reader of Gamasutra and all the blog posts especially that appear there. A few days ago I came across one that was new to me, original and informative. It is titled Marketing in Motion: A Year of Making Gifs and it an excellent read. This got me thinking that I could spice up my static web pages with some exciting animations. Hopefully bring some of the initial connectivity to my casual visitors to the web page. The image above works ok, and for a first try I am quite happy with it. I used a tool called GifCam. This made it pretty easy to create and the tool seems pretty good. Once I have gotten to play with it a bit more I will have to donate for sure. My only real issue with the Gif is the fact that this one is 354kb. Which is quite large for a small image and is due to the fact that the whole image is updating/moving. I will try to make more that are a little more static so they do not overload the web observers bandwidth. I am always looking for things that could help me promote the game. I do not however at this major development time want to spend hours on social media each day. That time will come and is not now. So poking things into the social media awareness is what I really need. Then I will have links and thoughts all across the internet for me to pull on later (I hope). So something else I have never done though I have been aware of it in some way is a place called imgur. This place is awesome I have to say. I could easily spend a long time looking at stuff on this site. Anyway the point is that I could post my images to this excellent discovery web site and hopefully one of them could possible go viral, which means on this site that it could get half a million views.. yeah! Imagine my game getting half a million eyeballs on it.. Woah!!!! Now imgur is an interesting place and I believe it will take practice to get the title of the image correct as well as the image itself. It looks to me like an art form I have never previously seen. I hope I can pick up some of the skills quickly. Marketing needs to be done, using Gifs on a site like imgur could be a good addition to a campaign.